Czech pressed glass beads are made in the Czech Republic the traditional way, by pressing hot glass into a heated mold. The 19th century was a period of industrial innovation, and new machines that could produce a wide variety of beads were developed. This meant that thousands of identical beads could be turned out quickly and inexpensively, but the process of making the molds was difficult. Cottage crafters were given several molds for each bead press, and turned out beads to order for their local factory. The Czechs became the masters of pressed glass. Most of this work is still done in rural areas with small family-operated factories. Glass finishes are added in the final step, many of the luster coatings are made with heated metals including gold. Thick rods of glass are heated to molten and fed into a machine that stamps the glass, including a needle that pierces a hole. The beads again are rolled in hot sand to remove flashing and soften seam lines. By making canes (the glass rods fed into the machine) striped or otherwise patterned, the resulting beads can be more elaborately colored than seed beads. Czech Glass Beads are greatly valued because of the high quality and tremendous variety of colors, sizes, shapes, and finishes. The term table-cut or window-cut refers to a molded bead shape, usually with a matte finish or luster coating applied that has then had slices or facets cut off and polished to reveal the glass beneath. Matte glass is achieved by dipping the bead into an acid etching solution. The many shapes available are often reproductions of vintage glass molds from the 1920s to the 1950s. Some shapes have been created more recently such as cats, butterflies, fish and turtles. This post began with researching art beads, but then I found Humble Beads by Heather Powers. And I fell in love with this lady's beads. I know there are lots of beads out there in the marketplace, but I think these beads are exceptional. The interplay of colors speaks to my artsy side. And why wouldn't they? Many of them are inspired by Impressionist paintings. The colors of the beads coordinate and complement each other beautifully. Beads that take their inspiration from Heather's favorite painters and designers. All beads are handcrafted from polymer clay and buffed to a matte finish. Inspired by watery hues and brush strokes of Monet's water lily paintings. This bead can be made into a cuff bracelet or a pendant. Each one is a unique mini-masterpiece. Bold cuff features a garnet, cream, & purple art bead with six strands of seed beads on memory wire. This cuff opens from the top to wrap around your wrist. The wire will never lose its shape. This design has been featured in Bead Style Magazine, Bead & Button's Beading Essentials, and on PBS' Beads, Baubles & Jewels. Heather Powers is an innovative bead and jewelry artist, creating art beads collected by bead enthusiasts all over the world. Her work has been featured on television, in magazines and books. Her mixed media jewelry designs are sold locally at art galleries and markets. Heather graduated from art school with a bachelor's degree in Fine Arts from Kendall College of Art & Design. She lives in San Antonio where she is a work-at-home mom, balancing business and family. Inspired by the colors and texture of Van Gogh's Starry Night painting. Stars of yellow and gold swirl around the midnight blue sky. Heather also sells Jewelry Kits, for two of her most popular bracelets and a lariat necklace. Everything you need is included, so you can make your own masterpiece! CloisonnÃ© is a distinctive art form that was developed in China in the 13th century, and it has grown to be one of China's number one exports. The making of cloisonnÃ© requires several processes: hammering, wire inlay, soldering, enamel-filling, enamel-firing, polishing, and gilding. The wire work in CloisonnÃ© beads can be flush with the enamel or it can be raised to create a 3-dimensional look. The wire can also be twisted to add more interest. CloisonnÃ© beads are created by soldering thin metal wire partitions to a base bead to act as a color separator. A powdered colored glass paste is then painted between the partitions. After a firing and polishing process, the bead is electroplated with a gold or silver film, and a beautiful bead is born. The artist forms delicate strips of metal-copper, bronze, or silver-to create a design. The bends are all done at right angles, so the wire doesn't curl up. This is done with small pliers, tweezers, and custom made jigs. The cloisonnÃ© wire pattern may consist of several intricately constructed wire patterns that fit together into a larger design. The wire pattern is soldered to the metal base. Using an alternative technique, the base is covered with a thin layer of clear enamel, then fired in a kiln. The cloisonnÃ© wire is then glued to the enamel surface with gum. When the gum has dried, the piece is fired again to fuse the cloisonnÃ© wire to the clear enamel. The gum burns off, leaving no residue. The artist then drops colored enamels inside the partitions of the wire pattern, similar to the paint-by-numbers technique. Various colors and transparencies can be used within the same partition to obtain the desired appearance. After the enamel has dried, the artist fires the piece in a kiln, which melts the enamel onto the base. Several firings may be necessary in order to build up the coatings to the height of the partitions. The exposed metal is electroplated with a thin film of gold or silver to provide shine and prevent corrosion. Finally, the bead is fired and polished several times to enhance the bright colors, and to produce the desired effect. Manic Trout is where you can find all of independent artist and jewelry designer Sierra Bailey's fine art and beautiful things. Sierra designs and creates handmade jewelry that is both colorful and unique and always fun to wear. You will always stand out in the crowd wearing an original design from Manic Trout! Pictured is a necklace she calls Sabita Cosmic Autumn Rebellion Necklace: Vintage brass creates the perfect foundation for jade, carnelian and buri root. 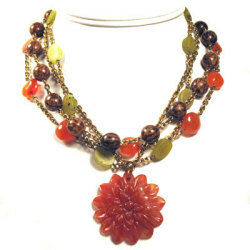 A large carved carnelian flower hangs center, the necklace is finished with a vintage brass clasp. Vintage brass chain, jade, buri root, carnelian and vintage brass spring ring. Though Sierra makes earrings and bracelets as well, I really think her necklaces stand out. Glass round faceted aqua blue beads, green round czech glass beads and blue tile beads provide a lovely backdrop for a beautiful aqua and turquoise Meena enameled, rhinestone and goldplate over sterling silver Minikari star hanging from the center. Vintage brass intertwines with ruby red glass, smoky quartz and bright cherry quartz. An ornate vintage brass locket hangs from the center. Finished with a hand made brass hook and eye clasp. Karen McClintock didn't set out to become a jewelry designer. In fact, no one could be more surprised by her success than McClintock herself. "I still can't believe this is happening," the 43-year-old Ottawa-based designer said repeatedly during the week we shared in Paris recently with Canadian fashion icon Linda Lundstrom. "How did I get here? It's surreal," she said, her utter amazement – and delight – evident. Things just seem to keep falling into place for McClintock, who has quickly become known as one of Canada's hottest up-and-coming jewelry designers. It all started about two years ago – as a bit of a fluke, actually. While getting ready for a garage sale, McClintock came across an old necklace, which she was convinced she could "improve." "I knew nothing (about making jewelry)," she admitted. So she headed over to the craft department at her local Wal-Mart and picked up what she thought she'd need to re-string a few necklaces for the garage sale. They sold like hotcakes. And she was hooked. I couldn't find her web site – she may not have one – but I did find some of her jewelry over at Sheperds's Fashions. It's very chunky and full of lots of luscious beads with some chain here and there as well. As a bead-lover, I never get tired of quality beaded jewelry, and I appreciate it when a designer is able to incorporate beads that many of jewelers might use but still manage to create unique jewelry with them. jewelry design Cynthia Bloom has done this by included beautiful crystal class button pendants to some of her creations. For example, here is a purple button pendant and crystal necklace. The button was hand-painted with accents of gold and kiln fired. The molds for the buttons are vintage Czech, circa 1910-1920. 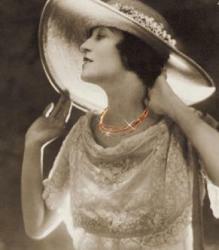 Obviously, Bloom is not the first to use a button as a pendant, but by using unique molds and creating her own components, her work becomes a step up from the average beaded jewelry. Mother's Day is on the way, and that means you BETTER get something m-o-m like n-o-w! Jewelry, of course, is always appreciated. If you are not exactly sure what to get for her, consider a jewelry piece that incorporates birthstones from all of her beloved children. Stranded has all kinds of gemstone beaded and wire jewelry, so I went virtual shopping over there. 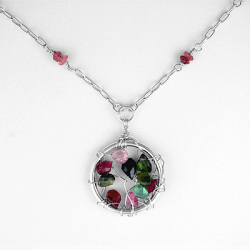 Pictured is a necklace full of different colored tourmaline gemstone beads. Even if you don't know for sure whose birthstone is whose, you can get her something colorful to just cover all the bases. This is another necklace with a mix of gemstone colors, this time all made of quartz. These earrings use a similar approach, again with multi-colored quartz chip beads dangling from pieces of chain.